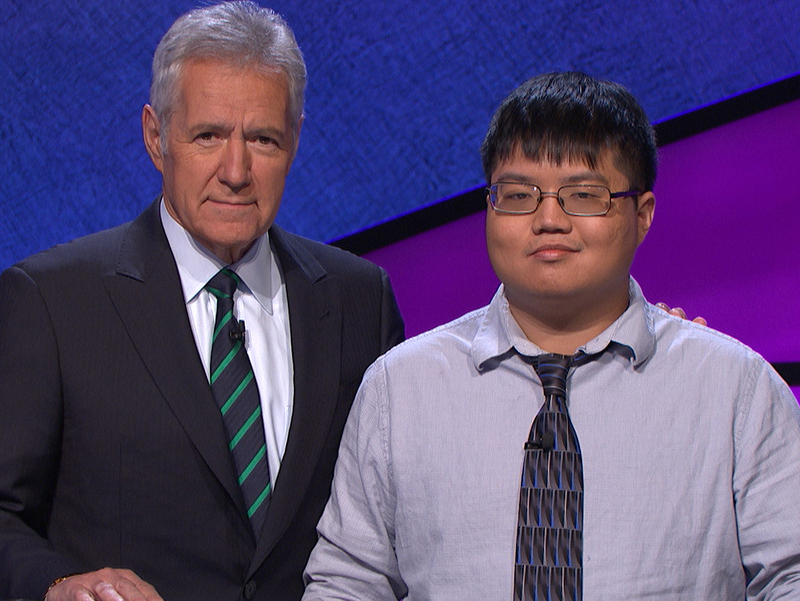 Back in February, Arthur Chu had one of the most dominant runs in the history of Jeopardy. I watched every game. It was like nothing I had ever seen on Jeopardy before. There was a palpable excitement when Arthur’s shows started. Oh sure, there had been big winners before, but Arthur was … different. He was monotone. He was intense. He was awkward, but in a way that seemed very real and very human. He bet big and he searched for daily doubles and he gathered a cult following. He openly talked to his fans and his enemies. Some lauded his ruthless pragmatism. Others called him the Mad Genius Who Destroyed America’s Favorite Game Show. Arthur won 11 straight games and took home $298,200, the third highest total in regular season play. I was delighted when he agreed to do an interview, and I am thrilled that he will be back in action in the Tournament of Champions this fall. Here, he talks candidly about his run on the show and his life since. Arthur, welcome to the blog. Arthur, you’ve gotten pretty famous since your run on Jeopardy. I can imagine that your newfound fame is exhilarating but also terribly frightening. Are you comfortable with fame? Do you enjoy having a platform to say things? Well, it’s not really the same kind of fame as being a real celebrity. It’s almost as if there’s this divide between my online life and my real life. People don’t recognize me on the street. But online I get tons of people commenting on stuff I’ve written. It’s kind of fun because I don’t have to engage with them if I don’t want to, but when I do want to, I have the ability to get feedback much more than I did before. I don’t worry about it. I see it as a responsibility. You sometimes see people get a lot of exposure and then they flame out because they’re not used to being criticized. I’ve been lucky so far because I have a lot of people who have my back, but I also have to keep in mind that there’s no shame in admitting you’re wrong or backing off from a position. I think being willing to accept that not everyone might like you is part of not going crazy with this stuff. Jeopardy has an online test. If you score high enough on the test, then they call you back and invite you to an in-person audition. They hold the auditions at various times through the year in different regions of the country. When I was living in Washington DC, I took the test in Baltimore, and I actually had to drive out to Baltimore on the day my wife and I were moving into our apartment. I went without her. She was pretty mad about it at the time. In retrospect, she thinks it was the right decision. The in-person auditions are pretty chill. You show up at a hotel or a convention center. They take your picture, and then they make you take a paper version of the online test just to make sure you didn’t cheat the first time. Then they ask you the same questions they would on the show, like tell us a good story about yourself. Then you play a really quick mock game just to see how you look and how you interact. It takes a whole day, but you’re only on the spot for a few minutes. After that, it’s just wait and see. You’re in the pool for a couple of years. I’ve taken the test twice. The first time was in LA before I was living in DC, so I got in on my second try. I had actually forgotten all about it, but I got a call and they asked if I could come out to LA in a month to be on Jeopardy. That’s when I started preparing. There’s a lot of information out there. I read a lot about Jeopardy strategy. Roger Craig was a champion awhile ago, and he was my role model through all of this. He was on the tournament of champions and he talked about how he used Anki, which is this flashcards app that keeps track of how well you’re doing and forces you to bone up on stuff that you’re not doing well on. So I used that to cover subjects that are important on Jeopardy. I spent a lot of time practicing, just watching the show, doing the flashcards, trying to get myself in that headspace where I was ready. I can imagine that no matter how much you prepare, no matter how much knowledge you accumulate, it must be a complete adrenaline rush when the music starts playing and Alex Trebek walks in and you start your first game. It’s weird because you spend so much time preparing and watching the show, but when the game actually starts happening, you just have to let it go. When I came on the show, I just told myself that I am playing a character. I’ve done theater before, and the easiest way for me to handle it was just to say, I’m playing this character, I’m not really me, I am playing the role of someone doing this. That really helped me and left a lot of the anxiety behind. My roommates and I watched your entire run on Jeopardy. I think we enjoyed the run because a) you were absolutely dominant, b) you didn’t take yourself too seriously, and c) you tweeted along with the show (since the episodes had been taped a few months prior). What was it like interacting with your fans and your haters during the run of the show? Twitter is a platform that is really addictive because it’s so real-time. It’s not like the feeling of publishing something and then waiting for a reaction. You’re just in an ongoing conversation with people. Live-tweeting Jeopardy was just a natural choice for me. It was a contrast between the person I was on stage and the person I was on the internet. On Jeopardy I was hyper-focused and ruthless and not that personable, but I had to be that way. But on Twitter I could riff on it, make jokes about it after the fact. I think that spoke to a lot of people. And, of course, the fact that I was talking to a bunch of haters on Twitter helped spread the controversy and give the story some legs. I would like to think it started a trend. After I live-tweeted my episodes, the college championship kids all live-tweeted their episodes. It’s just become a way to engage with the show. I think a lot of the appeal of Jeopardy is not just watching the show, but also having reactions to it, or talking about it. One of the things I think Jeopardy is starting to do is integrate that a little more. I wouldn’t be surprised if they encouraged second-screen interaction in the future. That’s how a lot people in my generation watch game shows. You received a lot of criticism from Jeopardy fans about your style of play, specifically the Forrest Bounce. As a baseball fan, it reminded me of the outlash against moneyball and sabermetrics. Like, for the first time people thought, “Hey, you know, maybe we should look at this differently.” And because it was so new and different, there was an outcry against it. But your style of play seemed wholly pragmatic. David Madden, who until recently was the #2 regular season player, used a very similar strategy. He bounced around from category to category and hunted for Daily Doubles. This was very unpopular, and he actually made a public donation to charity afterwards to sort of apologize to the American public. Which is funny because I always thought the point of the show was to get the most money for me and my family. So I never saw any reason to apologize. I’m acting inside the rules. People have actually said that I have a responsibility to make the show entertaining for the producers and the audience. If I were an actor being hired to do a job, that would be one thing. But I’m not. The whole idea of anti-rigging laws in game shows is that they want to see something real, they want to see how real people react when put into this situation. I understand why people were upset about it. People really enjoy playing along with the show. They flatter themselves because they’re doing well and spitting out answers – well, technically questions – when they hear the clues. But if you’re just playing the category top to bottom, you’re making it easier on the people watching at home and on your fellow contestants. So the point of bouncing around the board is to make things harder for them. A suggestion that was thrown out was to have the category names on the screen when the question is being read, so people remember what category it is. Because on the set we can see the category, but people at home can’t. I think that would be a pretty simple fix. For my part, I get excited when games are harder or more unpredictable. I find it boring to watch the show when someone isn’t Forrest Bouncing. I watched my own episodes and I was like, hey, this is fun, this is exciting, because you don’t know what question will come at you next. What has happened since Jeopardy? I’ve always been one of those people who posts their thoughts to the internet. I’ll make like page-long comments on discussion forums. And when I was in New York on Good Morning America the day after my last appearance on Jeopardy, I met Sujay Kumar, an editor at The Daily Beast. He wanted me to start writing for him because he liked my voice. I had done a lot of long interviews that showed the type of person I was. So I started writing for The Daily Beast, and lo and behold, I wrote this thing after the Isla Vista shootings about misogyny and nerd culture, and it went viral. I’ve been able to write about stuff I care about and have an audience. I wrote a piece for NPR’s Codeswitch about the Chinese-American accent. I recently wrote about Ferguson. A lot of people have shared that. So it’s a good feeling. You will be back for the Tournament of Champions this fall. Excited? The funny thing is that when I was first on Jeopardy, I didn’t have that much going on, so I could focus on the show. But now I have all these distractions, all this other stuff happening. There’s a lot of stress, there will be a lot of eyes on me, more so than if I had just done okay. There’s also some pressure because there’s this documentary film-maker named Scott Drucker who wants to do a documentary about me and my story. And it’s sort of unprecedented – not since 1989 have they let an independent film-maker onto the Jeopardy set. But he got permission from Sony to do this. So there’s a lot of pressure there. We’ll see what happens. This blog gets about four readers. So, to the four of them, would you like to promote anything? : The Kickstarter for the documentary, you can search for my name on The Daily Beast, and I’m also doing audio book work for a webcomic called Erfworld. And, finally, the world wants to know. What does Alex Trebek smell like? You know, I’ve always had a very weak sense of smell. I did get a static shock when I was on the set, so I treated that as a good sign.